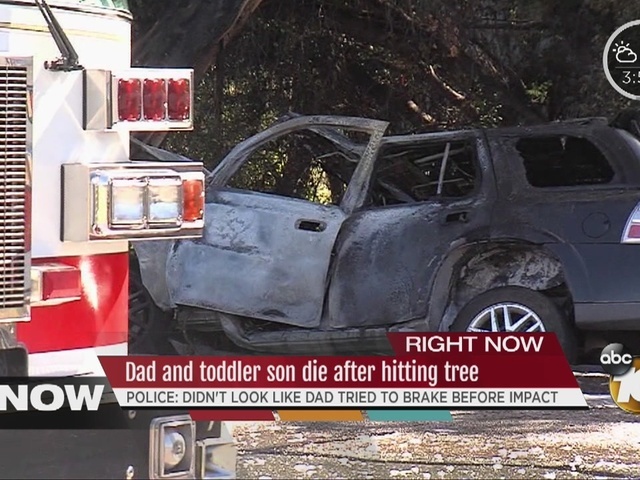 ESCONDIDO, Calif. - An SUV crashed off a North County road, hit a tree and burst into flames Thursday, killing the driver and his 2-year-old son. The 2006 Saab 9-7X was headed north on Bear Valley Parkway in unincorporated Escondido about 8:45 a.m. when it veered to the right off the roadway just south of state Route 78 for unknown reasons, according to the California Highway Patrol. The driver, 37-year-old Arthur Walker of Escondido, apparently did not brake before his vehicle plowed into a roadside eucalyptus, CHP public affairs Officer Jim Bettencourt said. A 62-year-old motorist who had been traveling behind the Saab pulled over and tried to get Walker out of the crumpled SUV. Unable to do so, the good Samaritan removed the boy from a backseat child-safety seat, after which the damaged vehicle became engulfed in fire, Bettencourt said. Walker died at the scene. Medics took the toddler to Palomar Medical Center, where he was pronounced dead. The child's name was being withheld this evening pending completion of family notifications, according to the county Medical Examiner's Office.